Drivers are, of course, the most entitled class of road users out there. Like the bullies they are, they shout and scream about others not ‘paying their way’ and ‘causing danger’, ignoring the massive costs we are all forced to pay to support their choices – the dollar cost of the roads they drive on, the environmental costs of the fuel they burn and the ultimate cost of the human lives they destroy – thousands of people killed every year in Australia by dangerous and negligent drivers. Cars bring out the worst in us. I drive sometimes; we have a family car. And I have to work hard to resist its insidious effects. Cut off from those around you, isolated from society and from the consequences of your choices we all too easily become selfish and thoughtless. There are so many examples of this selfish behaviour we have for the most part stopped noticing it – we accept the dominance of the motor car on our lives without a second thought. But having recently come across a series of examples of swingeing entitlement in action, I was moved to write about it. And it is parking. Specifically, parking on areas of public land reserved for pedestrians (and sometimes cyclists). This spot is directly in front of a car park. It is alongside a parking lane on the road. There is always parking available within 200m of this spot. Always. Yet it seems completely blocking this SUP is considered perfectly OK by a range of drivers. A car that could easily and legally fit in the parking lane (let’s not get into the fact that this is also a bike lane, but one that allows parking) instead is driven up onto an already narrow pavement, pretty much blocking it. Yes, workmen have to get to their worksite, but absolutely and completely blocking a path, forcing path users into a road when it would be perfectly possible to park in the traffic lane? I don’t know what the solution is to this type of behaviour. It is so ingrained that we have almost stopped noticing it. Perhaps we could phase out cars, say in the next ten years? Maybe then we could regain our humanity and compassion. 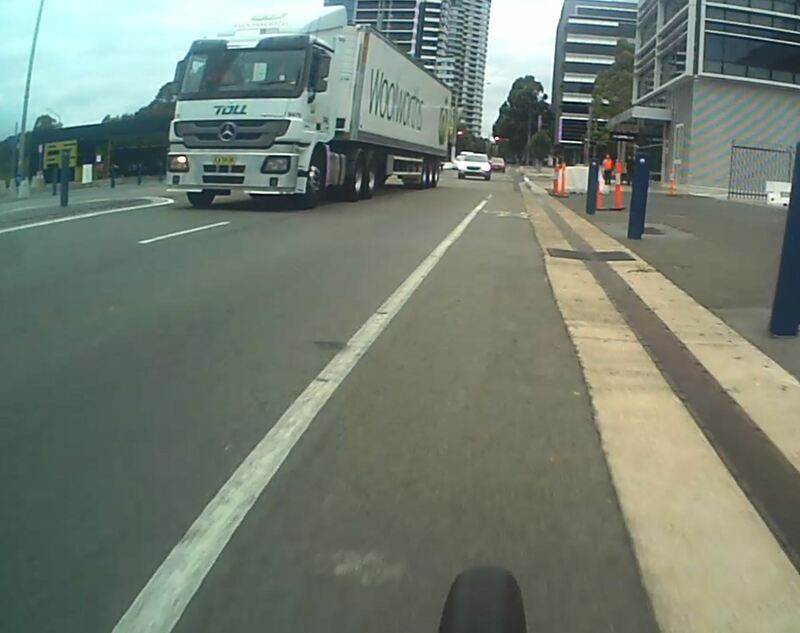 To my mind the environment is against them – a government generally hostile to cycling, apathy on the part of the public and helmet laws could well end up making them nonviable. Pretty much every part of that prediction came to pass. Bikes were vandalised, had the helmets stolen and were dumped, local councils passed regulations that imposed massive fines on the operators and the police kept us all safe with endless helmet crackdowns. I could feel smug about the accuracy of this prediction, but to be honest to bet against any kind of bicycle advancement in Sydney is a very very safe bet. Notwithstanding all these failures (four systems have completely gone; one limps on with a smattering of bikes and almost no investment or support), another system has sprung up – this time not with low-cost utility bikes, but with more sophisticated e-bikes. And so, I took one for a ride to test it out. The first impression were very favourable. These bikes are very comfortable. They are actually large enough to ride properly – the other systems, even the better ones, always felt a bit small for me (and I’m not especially tall). I could get the seat right where I wanted it, and sit very comfortably. The electric assist is not as refined as on Mrs Chillikebab’s e-bike, but certainly has some grunt. It tends to pull a bit too hard when you start pedaling, and the power seems to fade as you get up even a small amount of speed (but still below the 25kph limit for e-bike assist), but at low speeds it can really haul you up a hill with ease. There are no gears, but with the motor this is less of an issue. The app is easy to use, although there is no trial period (perhaps not surprising, given the expense of the bikes). There is a geo-fence, which once again is not well signaled in the app. I have seen quite a few Lime bikes outside of this area, so I’m not quite sure what happens if you go outside. But inside the area there is, for now at least, plenty of them around. How they keep them charged I don’t know; there must be quite a support system behind them. They are a bit more pricey than the other systems (a short ride will cost $3-5, vs the $1-2 for the non electric systems), but to my mind it is worth it – cheaper than the bus, comfortable and you don’t even work up a sweat. It is getting worse out there. Drivers are increasingly distracted. Mobile phone use is endemic, and rarely properly policed. Most modern cars now feature touch-screens that take drivers attention away from the road for ten or twenty seconds at a time as they prod at it to change the radio or operate the sat nav. Against this near-universal back drop, in Sydney it is further stoked by the increasing aggression shown by drivers towards cyclists. This is rooted in the aggressively anti-cycling stance of the state government, coupled with heavy handed anti-cycling policing, all capped with a broadly anti-cycling safety ‘industry’ that seeks to blame cyclists for the increasing road toll and a populist media near universally playing the ‘law-breaking cyclist’ and ‘war on the roads’ angles constantly. I am now at a point, sad to say, where I would not recommend to anyone they cycle in Sydney. I used to encourage my colleagues to cycle to work. I no longer do that. The environment is so hostile that I can’t recommend it. This, of course, makes me very sad, and also very angry. The sheer stupidity and short-sightedness of our policy makers and media is breathtaking. In the latest NSW budget, there are zero dollars for cycling, and all mentions of cycling targets or programs have been expunged from the Transport for NSW website. Pretty much all that remains are pages telling cyclists to wear helmets and ‘share the road’. Well, I was sharing the road the other day. It just seems others don’t want to share it with me. PS The police, predictably, refused to take a statement or follow up the incident, even when given the video footage. Too busy policing deserted stop signs, perhaps. You may remember a little while ago I blogged about a truck driver who gave me plenty of room. Well, I had another very positive experience the other day with a cement truck driver. It was around the same spot, at a point where the bike lane (a painted on one of course, so not proper bike infrastructure) follows the road around to the left, and I wanted to go straight on – meaning I have to go across the car lane. I was looking behind me, and saw the truck was coming up behind, so I slowed to enable him to pass so I could cross behind him. However, he realised what I needed to do, and was very helpful in making room, not overtaking me and ensuring my safety. I called out thanks, and he gave me a thumbs up from his cab as he went by. Top notch stuff from Hanson Cement – I took a moment to drop a complimentary line to them via their website. The warm fuzzy feelings evaporated a few seconds later, however, when a bus went roaring past me a few inches from my shoulder. 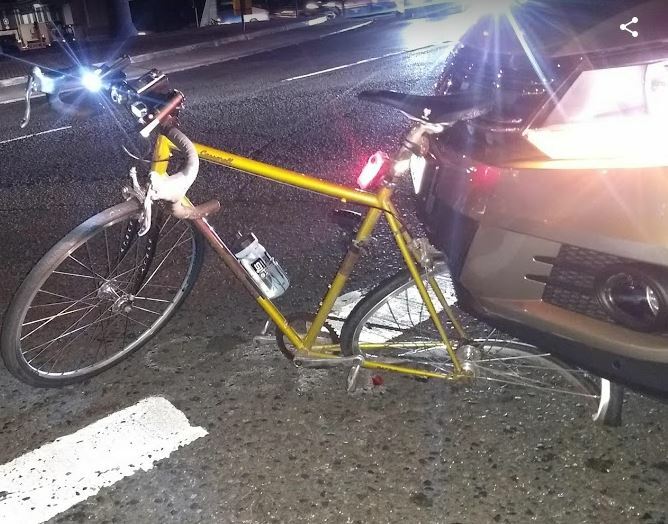 This incident perfectly illustrates why these painted on bike lanes can be worse than no bike lane at all. Because I am in the ‘bike lane’, I am invisible (or at least can be disregarded). But the effect of a large, fast vehicle going past that close to you is extremely unnerving – and the pulse of wind it produces can be quite destabilising. If you are a driver who does not cycle, please learn from these two incidents. Be a lovely person spreading warm fuzzy goodwill on our roads, not a thoughtless person spreading fear and aggression. [ click pic for video] Every day, I cycle through Sydney Olympic Park. As do many cyclists; it has wide roads, relatively light traffic and bike lanes – although they are the worse-then-useless painted on sort. Some of the junctions have stop signs. But the roads are wide, the traffic is light, the sightlines are excellent (especially on a bike), so traffic pretty much never stops – just slows and then continues. I, of course, do this on my bike. Having to come to a complete stop and then pick up speed again is tiring and unnecessary. In many places, it’s perfectly legal to do this, of course. It’s called an ‘Idaho stop’, after the first jurisdiction that introduced this rule for bicycles. And interestingly, research shows that places that have implemented the Idaho stop have lower bicycle accident rates at stop lines than those without. Bu, of course, not in cycling-hating Sydney. Not only is it technically illegal not to completely stop, the police seemingly have nothing better to do that wait behind the bushes at the side of the road, watching out for errant cyclists. One of those cyclists was me. And, sure enough, neee-naaa nee-naaa, I was pulled over. And I got a ticket. Now, since the even-more-anti-cycling-than-usual roads minister Duncan Gay, fines for bicycle offenses have been jacked up. The fine for this trivial thing? $330. Seriously. But to make it worse, when I received the ticket it also had three demerit points on it. Now, you can;’t get demerit points for riding a bicycle. Think about it – it makes no sense to lose your licence for something you don’t need a license to do. The NSW Transport Act makes it quite clear that demerits apply only to motor vehicles. But the cop apparently did the paperwork wrong. So not only are the cops vindictive, they are also incompetent. I didn’t want to schlep to court, but found I could plead guilty by post but ask for mitigating circumstances. I wrote a rather ranty and incoherent letter to the magistrate, and had the fine reduced to $200. But with costs and ‘victims of crime levy’, the total fine ended up being $367. Oh well. At least the demerits were taken off. You’d think, as a successful blogger and cycling activiste, I would be showered with freebies and samples of all sorts of things from companies eager to see their products tried and reviewed on these august pages. Well, you’d be wrong. I’ve never got so much as a pot of chamois cream (or custard creams, for that matter). Now, I realise that, in general, in order to get such goodies you have to have a blog that people actually read. And it probably helps if you’re not a nutter who keeps going off about helmets, and seems to end up in court rather regularly. But still. Come on, people. 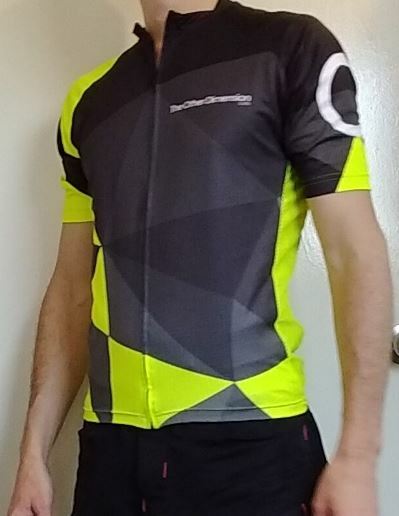 Andrew is a cyclist, and was frustrated that he couldn’t find a cycling jersey that had the commuter features he wanted but which didn’t look like something you’d wear to a night roadworks party. So he brought his considerable design talents to bear, and created one. He was kind enough to send me one, and I have to say it is terrific. 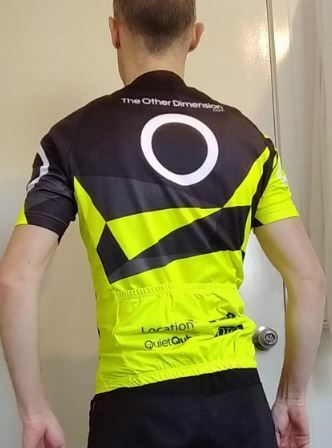 Apparently it has all these clever features (like hi-viz exactly and only where it needs to be for maximum effect, high-tec reflecto fabric stuff and infinitely large back pockets), but I just like it because it’s super comfy and looks great. I have no idea if you can buy them. If you can, I suggest you do. But if not, ha ha. You see, that’s the kind of exclusive-blogger-lifestyle that I now lead, with my super-exclusive bespoke jersey. Oh yeah. Anyone who rides a bike on the roads occasionally experiences car drivers passing rather too close. This is, of course, illegal, but given the cops are utterly uninterested in ever doing anything about it, I don’t see that it’s going to change soon. My new commute has a few spots where this is a particular problem. I’ve been planning to write a blog about it for a while replete with hair-raising video of people skimming past whilst texting on their phones. However, I’m also nervous such a post might be Whispering. So instead I’m going to talk about a good experience. One of the roads I ride on is Australia Avenue, going through Olympic Park. This has a ‘bike lane’ painted down the side, but as is often the case with paint (as opposed to proper infrastructure) it sort of makes things worse not better. Why? Well drivers somehow see that paint line as a magical defence, and don’t consider how close they are to you – the logic is that I have a bike lane, they are in the car lane, and everything is OK. Well, when the bike lane is only about one metre wide in total, and you are driving a large truck where the back wheels are grazing that white line, it’s not OK. It’s terrifying. Against that background, take a bow the driver of this Toll truck. 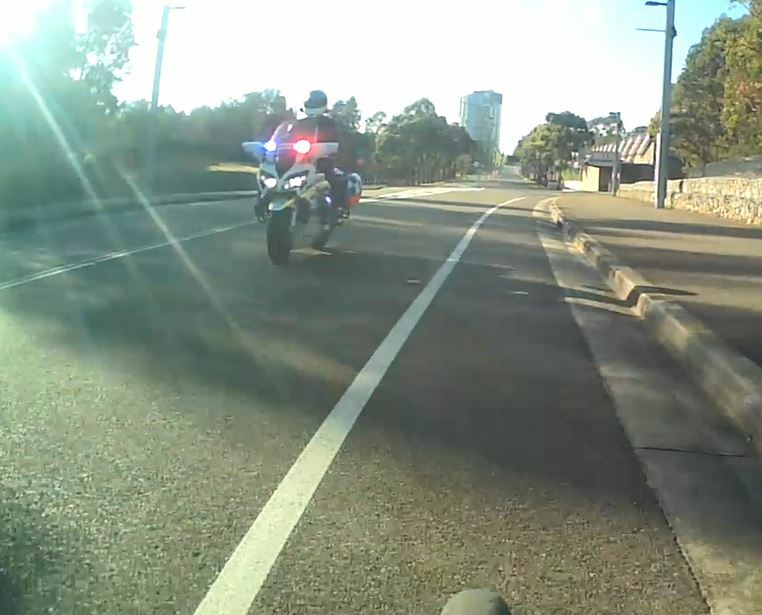 Not only did he go very wide when overtaking me, he was also aware of the potential conflict when we both pulled up at the traffic light, and waved me past to ensure I was safe and that I knew he had seen me. Well done. I took the time to send in a compliment to Toll via their website, which I hope reaches the driver in question. On Friday, I had a event in the evening after work. It was too far to cycle, and I was going straight from work. What to do? Leave my bike at the office all weekend? No, of course not. The answer seemed simple – ride a share bike! This would also have additional benefits. There used to be a fair few share bikes around the industrial estate where I work (mostly ReddyGo), and I often hopped on one at lunchtime to ride to a cafe to get lunch. Strangely though, they all seem to have vanished. I even took most of a lunchtime walking farther afield to where there were some marked on the maps for each of the brands, but each time I got there there was not bike to be found. Is the local council removing them? Are they being stolen? Whatever the reason, it’s a bit frustrating. So I figured that by riding one to work, I would at least get one bike there that I could use. And I thought I might park it on company property (although accessible), under the watchful eye of a security camera, to dissuade councils and thieves from taking it. Given it is a fairly long ride, I wanted either a ReddyGo or an Ofo. And, checking the map in the morning, there was an Ofo right there on my street, just down from my house. Perfect! I jumped on board, and set off – rather more ponderously than usual. The Ofo is an OK bike, but it is just that bit too small, which makes it rather tiring to ride. Still, I got there. According to Strava, my average moving speed was 18km/h, as opposed to my usual 23km/h – overall it took me about eight minutes longer. This is not really very much. It just goes to show that plodding along is still a pretty efficient way to travel – you don’t have to be super fast to cover distances in a reasonable time on a bicycle. 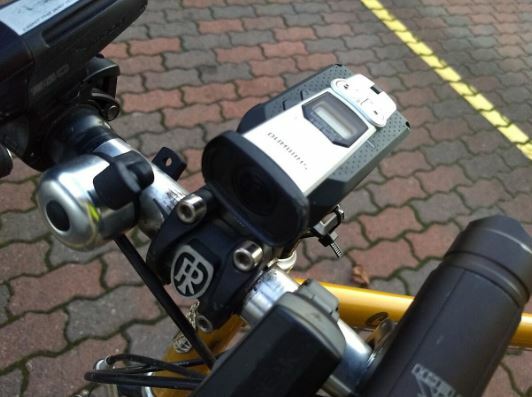 When I parked the bike, I got a warning that I was outside the GeoFence area – in other words, I had ridden the bike further from the centre of Sydney than was allowed. I mentioned this GeoFencing in my review of Ofo, but since then they have expanded the area quite considerably. Given that I had seen several Ofo bikes on the map near my office (although, as mentioned, none of them were actually there when I went to find them), I assumed that the area now extended out that far. Apparently not. So I have a 20 point penalty on my score. I did use the same bike at lunchtime twice – once to go to the shops, and once to come back. I got the warning message again both times, and was wondering if I would end up with a 60 point penalty – although that seemed a bit harsh. 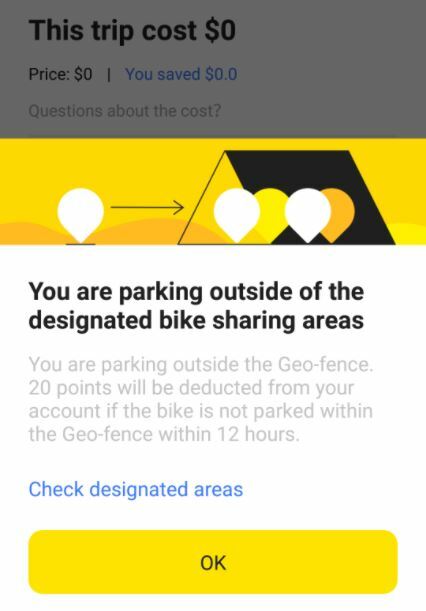 Borrowing a bike that’s already out of area surely shouldn’t result in further penalty just because you didn’t ride it back inside the GeoFence. 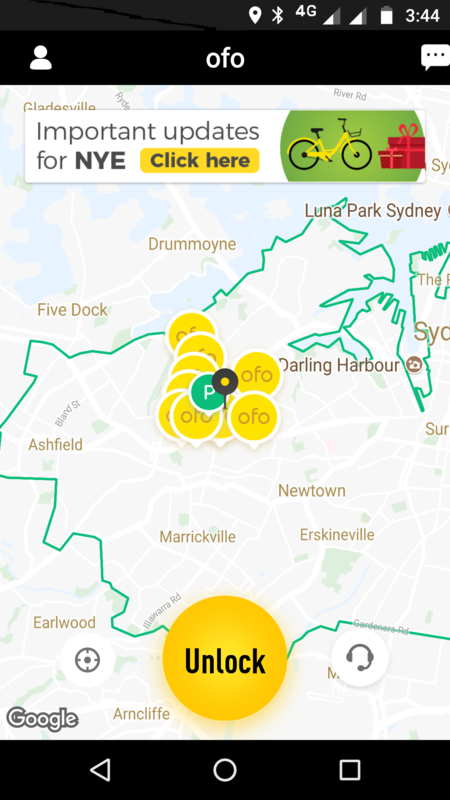 I think it would be helpful if Ofo shaded the whole area outside of the GeoFence on the map a different colour, as it’s quite hard to see otherwise if a particular suburb is inside or outside the area. I suppose at some point I’ll have to ride it back into the area, and perhaps swap it for a ReddyGo. Ho hum. 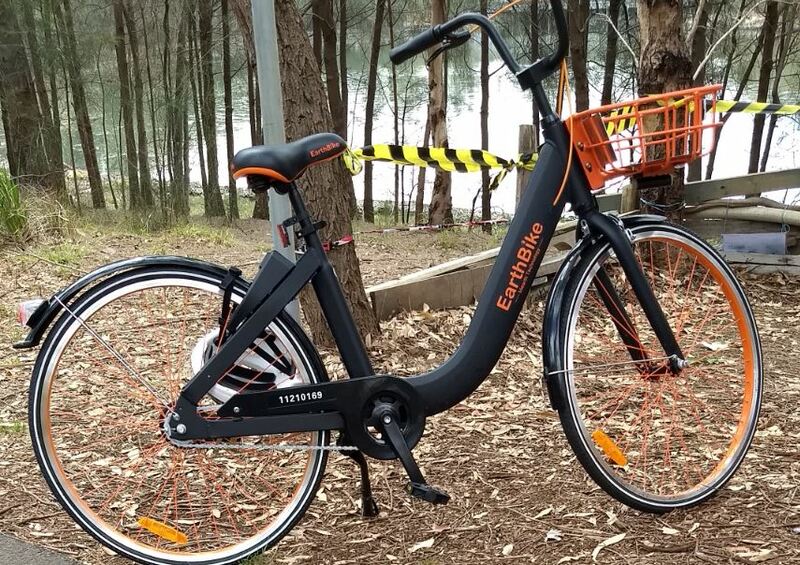 Hot on the heels of ReddyGo and Obike (click here for my in-depth review of those two schemes) three more bikeshare companies have arrived in Sydney. And, of course, your intrepid correspondent has tried out all of them for your enjoyment and education. First up, Earthbike. These black and orange bikes have been appearing a lot around Olympic Park, although I have’t seen many of them elsewhere. So I downloaded the app and tried one out. Or rather, I tried to. You see, the app is completely non-functional. It’s horribly translated from Chinese (with occasional Chinese prompts and messages flashing up, and a weird thing where it refers to bikes as ‘cars’) and riddled with bugs (e.g. you end up having to use your phone number as your password, because of the way the sign-up form is designed). The map does not show any bikes on it, despite the fact I was standing next to three of them. And ultimately doesn’t allow you to actually unlock a bike, as when you activate the camera to scan the code it gives an error – and there’s no way to type in the bike number either, as the scan screen closes after the error. It’s completely hopeless. And I’m not the only one with problems; it has universally one-star reviews on Google Play, with everyone complaining that it just doesn’t work at all. I did see someone riding one of these bikes the other day, so evidently it is possible – perhaps the iOS app is somewhat more functional. But I’m sorry, dear readers, I was unable to even try this scheme out – which puts it firmly at the bottom of the list in terms of quality. How on earthbike these people are going to make any money I can’t imagine. In better news, both Ofo and Mobike are much more polished, and work pretty much as you’d expect. 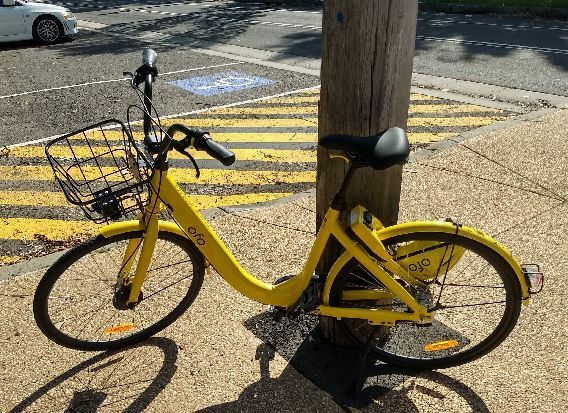 Ofo was the easier to sign up to – much like ReddyGo you can initially scan and use a bike without needing to enter payment details and so on, which is great when you start. 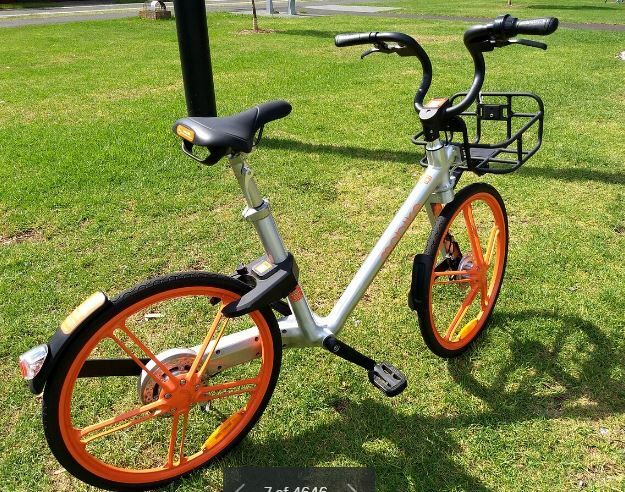 Mobike you need to immediately enter a credit card, which is a little bit painful (no PayPal? ), but isn’t a showstopper. Overall the two apps are OK, but both had problems in showing me my rides – Ofo gave me a ‘data parsing error’ (which later cleared up), whilst none of my rides actually appeared on the Mobike app – possibly a side-effect of the free rides promotion they are running in December, but a bit of a shame as it’s nice to see where you went afterwards. Overall, I’d still give ReddyGo the title for the best app, but Ofo is pretty close. One thing the Ofo app has which the others don’t seem to is the concept of ‘operational zones’. There’s actually nothing in the app that explains this, but on their website they explain that you should only leave the bike inside the ‘operational zone’ to avoid having points deducted. This could really do with a clearer explanation, I think. I didn’t try riding outside of the zone, so I don’t know if the app warns you or not – I’ll have to try this another time. The operational zone is pretty tight to the centre of Sydney, so it would be easy to go outside of it. But what about the bikes? Well, the most striking of the two is Mobike. These bikes just look cool, with their monofork wheels and crankshaft drive system. 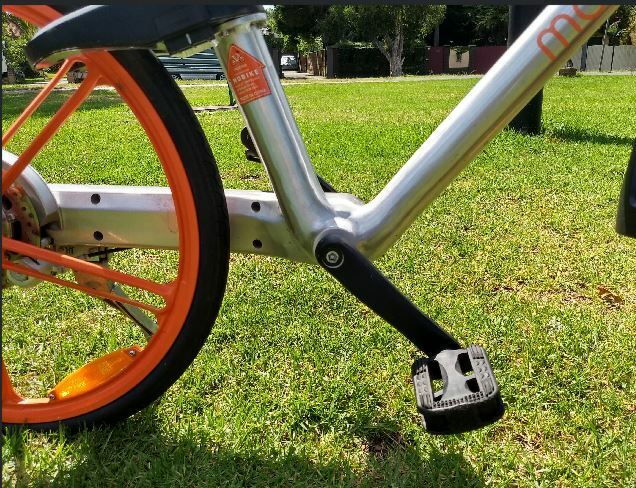 The Mobike drivetrain sort of hums as you ride, which is somewhere between cool and annoying. There are no gears, so you just get one low-ish gear to manage with. Ofo is a much more conventional design, with a three-speed nexus hub, normal mudguards and a chain drive. The Ofo has roller brakes, but they work fine (so much better than the woeful oBike ones). I have to say though, the Mobike brakes are awesome. It has a disc brake on the back, and some sort of fancy roller brake on the front, and they work really well – smooth, powerful and without grabbing or locking-up. Both companies seem to have heeded my complaints about how hard it it to adjust the seats on the ReddyGo and oBike, as they have a spring-loaded seatpost that pops up to its highest point when you release the cam, and can be easily pushed down and adjusted. Both worked really well; the cam was easy to turn and held the seat firmly. Yes yes yes, but what are they like to ride? Well, the Mobile is horrible. I really really wanted to like it, as the design is so cool, but it’s just a terrible bike. For one thing it’s tiny – feeling even smaller than the oBike. And the most weird thing is the length of the cranks. They are really, really short. I didn’t have a tape measure on me, but they are only one mobile phone long – or about two-thirds of the length of the ones on my regular bike. This means it feels like riding a kids toy – your feet seem to twiddle round, and you can’t get any leverage. Even with the low-ish gearing, this makes riding the Mobile extremely tiring. Just riding along on the flat is hard work. Such a shame, as the design is really eye-catching – I got some admiring(?) looks as I rode along on it. The Ofo, by comparison, is terrific. The seat gets a bit higher, and it just feels like a normal bike. The airless tyres are less harsh than on the ReddyGo, and it’s also surprisingly lightweight, which makes it easy to pedal. The gears allow you to both tackle the hills and speed along on the flat. It’s the most comfortable bikeshare bike by some margin – and so dethrones the ReddyGo as the best one to ride. So which one should you sign up for? Well, Ofo has the best bikes, but check the operational zone thing carefully. I live outside the zone, for example, so it’s no good for me to jump on one to ride home from the pub. ReddyGo has reasonable bikes and the best app, so is also definitely a contender. 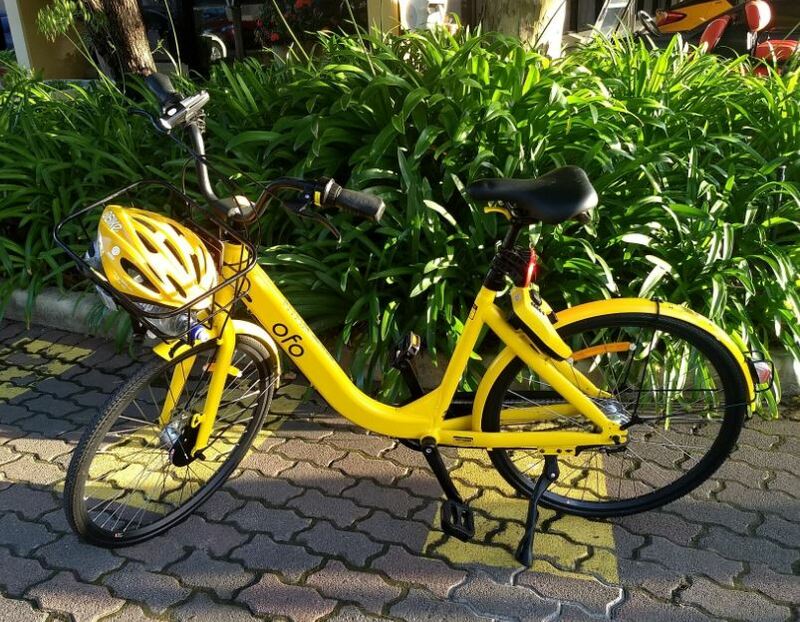 oBike seems to have the most bikes out there – they are the ones you see everywhere, so if you’re looking for convenience, then it’s a good choice although the bikes are hard work. And if you’re a hipster who cares more about how you look than how easy it is to ride, go for Mobike with their trendy design.